“Black and White – August.” Photo by Erin Brown. Door County is widely known for its rich artistic and agricultural history, yet these two cornerstones of peninsula life haven’t always intersected in obvious ways. 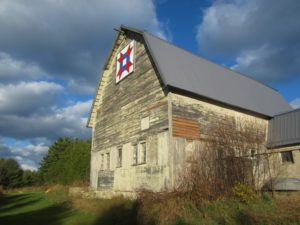 That’s why, in 2010, the University of Wisconsin-Extension office in Door County collaborated with local organizations to start the Door County Barn Quilt project. Barn quilts – the large, plywood squares or rectangles featuring colorful quilt block patterns – have enjoyed increasing popularity since the idea was started by Ohio farms in the early 2000s. Installation of “Hunters Star” at Uecker Farms in Forestville. Photo by Dawn VandeVoort. In the 17 years since, the movement has grown to include creation of barn quilt “trails” in more than 40 American states. Dawn VandeVoort, 4-H Youth Development Coordinator with the Door County UW-Extension office, explains the beginnings of the movement on the Door Peninsula. “There were community members that had seen barn quilt trails around different parts of our state and really thought that it would be a great opportunity for us to highlight some of the agricultural aspects of our community, the history of agriculture in the county and really showcase some of the beautiful old barns that we have so they thought it would be a really great community project,” VandeVoort said. 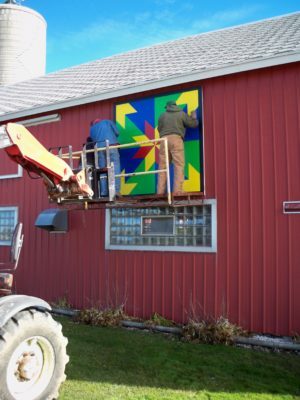 In the first round of Door County’s barn quilt project, 10 plywood squares were painted with patterns selected by barn owners. These patterns, along with the colors used and name given to them, often hold great significance to the family choosing them. “I know that there is a barn quilt in Southern Door where each of the family members got to pick a color that would be in the pattern. There’s a quilt up in Jacksonport that signifies family members that have served in the military so each of the quilts kinds of has its own unique story or importance or significance to a family,” VandeVoort said. To date, the project includes more than 50 quilts, which were made by volunteers of local 4-H programs, quilt guilds, FFA volunteers and others, who drafted, painted and installed the quilt blocks at no cost to the owners. It lives on through sale of annual barn quilt calendars with proceeds supporting Door County 4-H programs, which also serves an important role by highlighting the ongoing contributions of local farmers and producers. “Farmers Daughter.” Photo by Tad Dukehart. On Saturday, Feb. 25, the Door County Historical Society will host a winter luncheon and two presentations about the peninsula’s agricultural history. The lunch and programs, “Door County Barn Quilt Project” and “Farming With Horses: A Trip Down Memory Lane,” will be held at the Mill Supper Club beginning at 11 am. 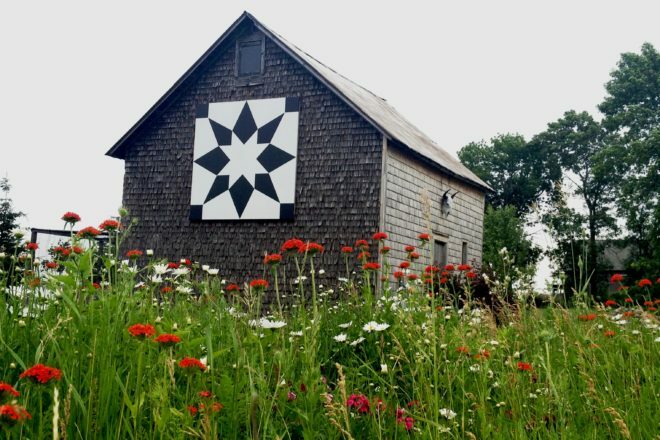 VandeVoort is the presenter of the barn quilts program and will discuss its history in Door County, showcase barn quilts from local and statewide barn quilt trails, and talk about how barn quilts have expanded in Door County. For further information, contact the Door County Historical Society at 920.421.2332 or email [email protected].